Abstract: Early medieval Scandinavians operating in European Russia, often labelled as Rus’ or Varangians in contemporary sources, were in contact with steppe nomadic tribes since the ninth century. These contacts, however are largely neglected in scholarly discourse. In the present thesis, it will be pointed out on the basis of Byzantine, Muslim, Slavic and Old Norse written sources that apart from occasional hostilities, the relationship of the Viking Rus’ with the various (culturally) Turkic groups of the Volga-Dneiper region (with emphasis on the Volga Bulghars, Khazars, Pechenegs and Magyars) could have been fruitful on multiple levels. Besides the Slavs, Turkic nomads were the main partners of the Viking Rus’ in the period, testified to by close commercial ties and joint operations in warfare. It will be argued that these contacts resulted in cultural borrowings, and contributed decisively to the development of Rus’ identity during the course of the ninth-eleventh centuries. Although mainly a historical study, the investigation will be occasionally supplemented with archaeological and linguistic evidence. 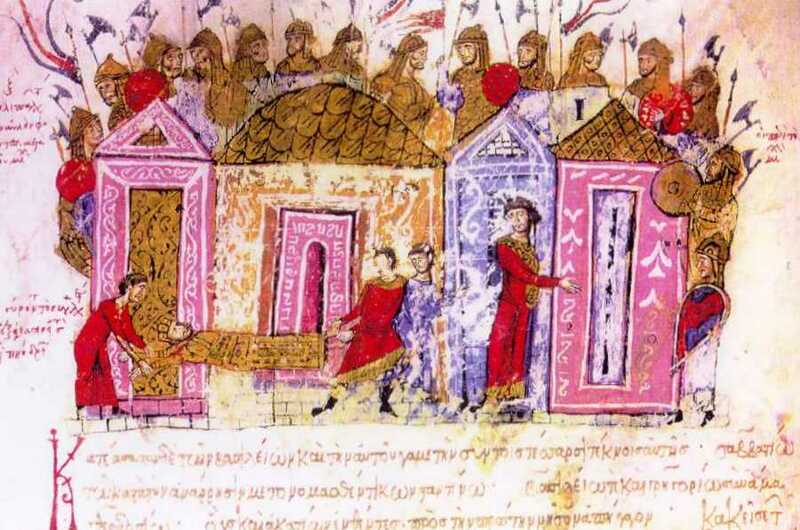 Top Image: Varangian Guardsmen, an illumination from the 11th century chronicle of John Skylitzes.